In an out-of-character program, Clay discusses his recent trip to Rome and how it’s deepened his understanding of Jefferson. "[Visiting Rome has] deepened my understanding of Jefferson because the classics were central to him in a way that they no longer are to our culture. I studied all of these things thirty years ago at Oxford, the University of Minnesota and the University of Colorado, etc. But now, here in my older time, I've had this chance to go back — to read these great texts again: Plutarch, Plato, Caesar, Cicero, Tacitus, Livy, Polybius." Download this week's episode. You can find additional, recommended reading for this week's subjects at the end of this blog post. The Pantheon, 2005. Photo by Arpingstone via Wikimedia, CC BY-SA 3.0. Interior of the Pantheon, Rome, c. 1734 by Giovanni Paolo Panini, public domain from the National Gallery of Art. "It's the largest free-standing dome, still, in the world. Around 125 AD, it was rebuilt under Hadrian. It's a perfect building, in Jeffersonian terms, because it's a perfect sphere; there's this dome, but if you measure from floor to ceiling and then from wall to wall, it makes a perfect sphere — like a beach ball — and then it's contained in a cylinder. So these are, in geometry, two perfect solids: a sphere contained in a cylinder." "The walls of the building are over 20 feet thick so that they can support the tremendous weight of the dome. The height to the oculus and the diameter of the interior circle are the same (144 feet), so the dome would fit perfectly within a cube—or the interior could house a sphere 144 feet in diameter. The Pantheon has the largest surviving dome from antiquity." "It's a magnificent building," Clay continues, "and Jefferson never saw it, but he then made the Rotunda — the library at the University of Virginia in Charlottesville — a smaller version of the Pantheon. "When I was sitting outside at the fountain, looking at [the Pantheon], this time I realized how strong it is, how massive it is. It's Roman. There's nothing light about it, there's nothing airy, there's nothing lyrical about it. It is a massive, concrete building with a portico with gigantic granite columns and when you look at it, you see strength. Panorama of the Pantheon, CC BY-SA 3.0 by Maros M r a z via Wikimedia. Click to enlarge. Maison Carreé à Nimes by Edouard Baldus (1813-1889), public domain via New York Public Library Digital Collections. "I had a revelation, and that is: Even though Jefferson used the Pantheon as the basis for the Rotunda, I think if he had actually gotten to Rome he might have found the Pantheon to be too massive and too brute in its strength for the kind of republic that Jefferson had in mind for the United States. I sat there and looked at it, and I was kind of overwhelmed by its representation of the power of the Roman Empire. The Roman Empire did not please [Jefferson]. But the republic of Cicero, and so on — of Cincinnatus — Jefferson deeply admired. So I wonder if the Pantheon would have worked for him. From the Encyclopedia Virginia: "A fire, caused by faulty electrical wiring, started in the annex on October 27, 1895." "Even though the Pantheon mattered to [Jefferson], he was looking at it in books, in woodcuts, descriptions by 18th-century travelers — if he had been there, it might have overwhelmed his small 'r' republican sense of the United States. I think he would have said, This is what you would expect of a monarchy or a world empire. It's not quite delicate enough for the aspirations of the United States. So when he built the Rotunda at the University of Virginia — a magnificent building, one of the great buildings in the United States, recently restored — he made it lighter. He took some of the heaviness of the original Pantheon out of it. Instinctively, he knew what he wanted." The Pantheon. Photo by Anthony M. via Wikimedia, CC BY 2.0. The Parthenon. Photo by Florestan via Wikimedia, CC BY 3.0. The Maison Carrée. Photo by Danichou, public domain via Wikimedia. The UVA Rotunda. Photo by Aaron Josephson, public domain via Wikimedia. This is my 1:1 scale Minecraft model for the Pantheon, the famous Roman temple. Just like my other creations, it is intended to be as close to an accurate representation of the real building as possible given the limitations of 1-meter cubes. I spent a great deal of time researching the dimensions of the structure, especially when calculating the dome. Yes, the entire structure was built one block at a time in Survival mode with cobblestone that I branch mined nearby and baked in many furnaces at my sanctum. And because I know people will ask, the video was shot with a mod that allowed me to fly, although I never used any mods during the actual construction. You can see Mr. Schutt's plan designs in a spreadsheet, and also view a photo album. Caravaggio (c. 1621) by Ottavio Leoni, public domain from Wikimedia. Caravaggio is, as Clay explains, "a 16th century painter. His paintings are characterized by simplicity, by an amazing use of darkness and light; he used people from the street as his models. There's a realism — his saints have dirty feet — there's a famous painting in the Borghese gallery of Mary, the mother of Jesus, scotching a snake with her son and she's a peasant woman. She has large breasts; she's a woman, she's not some ethereal creature who's said to be the Virgin Mary. She's an actual woman from the streets of Rome. Madonna and Child with St. Anne by Caravaggio, 1606. "He does this with all of his figures. It was scandalous at the time but also people were fascinated by it. The massive painting Caravaggio did of Mary, the mother of Jesus, was rejected by the church; it was commissioned and it was rejected because she was bosom-y and not seen as slender and virgin-like enough for the mother of God. But his view was, Mary, among other things was a woman; she gave birth to a child, she breast-fed that child. Let's be real. "He said, if St. Peter is about to be crucified, and he's naked and his feet are bare, they're probably filled with dirt. They're probably smudged. He wanted to shake up the over-prettified world in which all saints were seen as people who had never gotten their hands dirty in their lives. "Caravaggio said, Let's look at the world as it actually exists. He had the revolutionary boldness to paint Saints as actual humans who lived on Earth and not some sort of angelic creatures who happened to have visited the Earth. "I would be very much surprised if Jefferson could resist the works of Caravaggio." 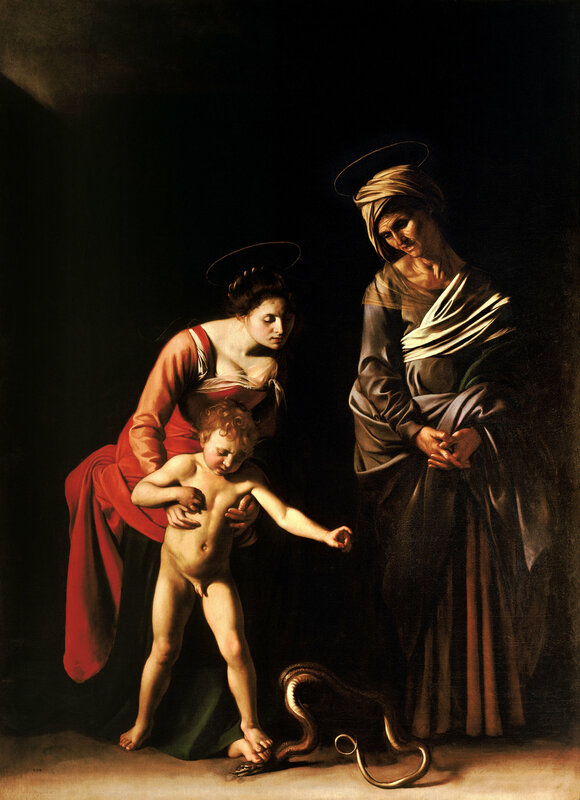 Want to learn more about Caravaggio? Take a look at his Complete Works, a 2015 fine art book by historian and professor Sebastian Schütze. Judith Beheading Holofernes by Caravaggio, c. 1598–1599. "I wish I knew what Jefferson would have thought of the work of Caravaggio," Clay says, "but I do think I know what Jefferson would have thought of Bernini and Michelangelo. They're both sculptors. Michelangelo came first, Bernini came later. They both have amazing sculptures of David, as in David & Goliath. Everyone knows Michelangelo's David, it's one of the supreme works of art." "Bernini's David is completely different [from Michelangelo's]. He's not in repose, he's actually twisting because he's about to throw the sling with the rock in it. His face is filled with kind of a grim athletic determination. There's tensile strength all over the statue. You get the sense that there's all this energy being built up that's about to be unleashed on this giant. "I think Jefferson would have preferred Michelangelo's by far because it is so ideal, and Jefferson was always dreaming of an ideal world. Even so, I think if he had seen the Bernini statue, he would have loved it because he loved The Aeneid, Virgil's great national epic in the Latin world." 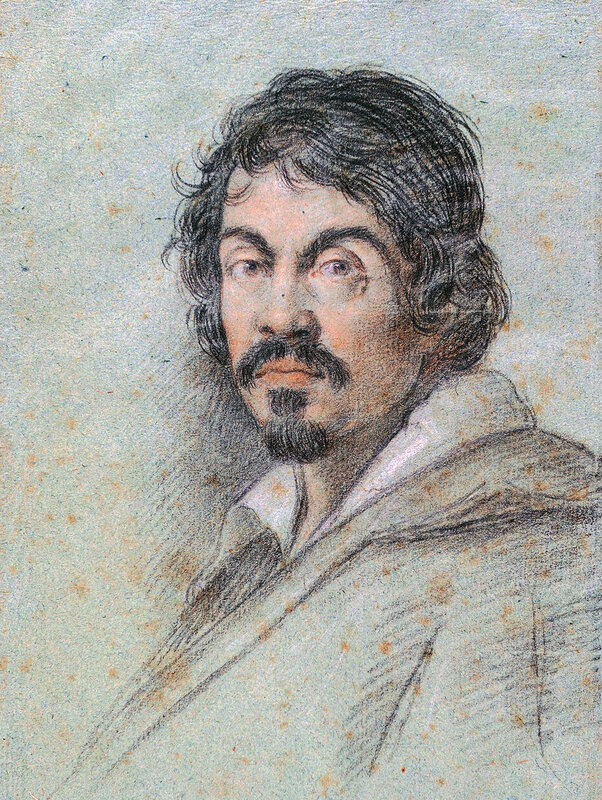 Gian Lorenzo Bernini, self-portrait (c. 1623), public domain from Wikimedia. Michelangelo's David. Photograph by Jörg Bittner Unna, CC BY 3.0. Washington and Hamilton: The Alliance That Forged America by Stephen F. Knott and Tony Williams. This book was mentioned briefly in the podcast intro. David comments: "A very enlightening book. A lot of people thought Jefferson was pretty much nuts, didn't they?" The Guardian: "Beyond Caravaggio review: a masterpiece of surprise"
The Guardian: "Villainy and visionaries: how Caravaggio’s followers saw the light"
The Guardian: "More savage than Caravaggio: the woman who took revenge in oil"
NPR: "Long Seen As Victim, 17th Century Italian Painter Emerges As Feminist Icon"
Washington Post: "Cicero used to be boring. With Trump around, he’s breathtaking." "Human nature is a constant."